The Design: Plastic body, very simple-looking. The phone is quite comfortable to hold in hand. The Display: 4.3", IPS, 960x540 pixels, 256 ppi pixel density. The Camera: 5MP camera, 480p video recording @30fps. The Audio: The phone features one mono speaker located on the front of the device, which offers reasonably good quality for the price. The Battery: Capacity: 1980 mAh. Talk time: Up to 24 hours for 3G. Standby time: Up to 400 hours for 3G. The UI Speed: Moto E offers pretty solid performance, with a few hiccups from time to time. The Overall Experience: With the price starting at around $129/£89 without the contract, Motorola Moto E is one of the most affordable phones you can buy right now. 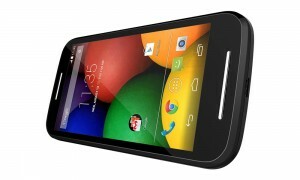 There is almost no other Android Phone like Moto E on the market. It has a solid build, good battery, decent screen, and on most occasions it runs really well. If you're on a tight budget, or buying a smartphone for a kid or an elderly person, Motorola Moto E might be a perfect choice for you. Very cheap, good quality screen for its class, pretty solid battery. The phone slows down occasionally, really bad camera, no front-facing camera, limited internal storage. The camera on the Motorola Moto E is pretty bad, so keep that in mind if you like to take a lot of pictures with your phone. Also, there is no front-facing camera. Internal storage is very limited, which means you will most likely have to buy an SD card. 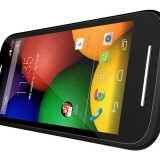 Find the most competitive prices for the Motorola Moto E by viewing the table below. If viewing from a mobile device please click on + to get more information.